The Private Granite Suites offer an extraordinary experience for the exclusive use of 6 guests. Bold, inspiring materials mirror the extrusion of granite rocks that flank the camp while conveying the raw essence of Africa. 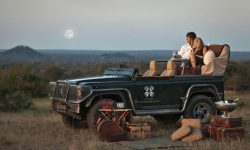 Londolozi Granite Suites offer an unforgettable experience in the bushveld. The emphasis is on space, light and privacy while blurring the barrier between inside and out. A seamless integration with nature is achieved with large doors and windows all opening directly onto the Sand River. This luxury safari lodge is for the discerning traveller who appreciates the finer details of an African safari. Each of the 3 luxury suite has a private, heated swimming pool. The Private Granite Suites can be booked individually or as a private camp for six guests, making it ideal for honeymooning couples or small groups celebrating special occasions. The Private Granite Suites does not accommodate children under the age of 16, unless guests book the camp exclusively.